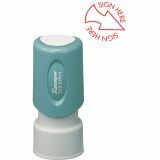 Xstamper Pre-Inked Spec SIGN HERE Stamp - Light red ink SIGN HERE specialty stamp with an arrow is pre-inked and re-inkable. Retractable frame keeps stamp surface away from desktop until ready to use. Plastic cap makes it safe to carry in purse or pocket. Impression size is 5/8 diameter."